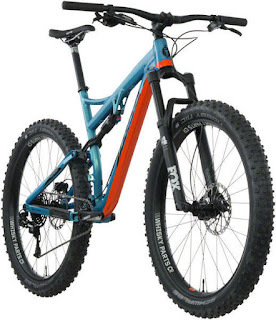 The Salsa Cycles Pony Rustler has "any singletrack trail in the world" capability, and takes an aggressive approach with the ground clawing, inspirational stability of 27.5 x 3.0" tires. Mix this footprint with short and agile chainstays and Split Pivot full-suspension design, and you’re dressed to impress while you bust new moves on the mountain bike trail dance floor! In stock in size Large at the Century Cycles store in Medina, and in Medium in Peninsula. Stop in for a test ride!